The design of the Fusion, shown, is based on the Evos concept unveiled at the 2011 Frankfurt auto show. DETROIT -- With the redesigned U.S.-market Fusion unveiled at the Detroit auto show, Ford Motor Co. is taking dead aim at a broad swath of competitors in the hard-fought mid-sized sedan segment. The car's sweeping sculptural new look is geared for customers bored by the blandness of the perennial segment leaders in the U.S. market, the Toyota Camry and Honda Accord. U.S. sales are scheduled to begin in the second half of this year. Prices have not been announced. The car will go on sale as the Mondeo in Europe in the first quarter of 2013. Mark Fields, Ford's president of the Americas, says the Fusion gives Ford an opportunity to "grow this part of our business." The Fusion's dramatic design is based on Ford's Evos concept, which was shown at the 2011 Frankfurt auto show. The horizontal chrome bars that are a signature of the current Fusion have vanished. Also gone is what Christopher Hamilton, chief designer, calls the "slab-sided look" of the current vehicle. Some journalists and analysts who saw the Fusion during a media preview said the car appeared to have taken cues from Aston Martin, an English sports luxury brand Ford once owned. "To me it looks expensive," says David Sullivan, analyst for AutoPacific. "It's for people who don't want the vanilla-flavored Camry. Fusion is not going to appeal to some people. I think Ford is OK with that." Hamilton says Ford took feedback from customers all over the globe in designing the Fusion. Customers in China thought the headlights on an earlier design looked "too sinister," he recalls. Ford modified the design. In years past Ford wouldn't have sold this car in markets such as China. But the world has gotten smaller, Hamilton says. "The difference between the Chinese customer and the North American customer is not that much," he says. With a plug-in hybrid version of the Fusion that Ford says will achieve 100 mpg (2.3 liters/100km) on the highway, Ford also is gunning for customers who want more space than they can find in the Chevrolet Volt and the plug-in version of the Toyota Prius. In gasoline-engine versions, Ford will offer only four-cylinder engines. Gone will be 3.0- and 3.5-liter V-6 engines offered in the 2012 Fusion. At the top of the range will be Ford's 2.0-liter EcoBoost four-cylinder. Ford says the 2.0-liter will pump out 237 hp and get 25 percent better fuel economy than the outgoing 3.5-liter V-6. Ford did not discuss specific mpg numbers for the 2.0-liter engine. Ford said the 1.6-liter engine, which it expects to be the volume leader, will get 26 mpg (9 l/100km) in the city and 37 mpg on the highway. Ford is offering two hybrid powertrains: a gasoline-electric hybrid and a plug-in hybrid. The Fusion Hybrid will get 47 mpg city and 44 mpg highway. The Fusion Energi, a plug-in hybrid, will hit 100 mpg, Ford predicts. 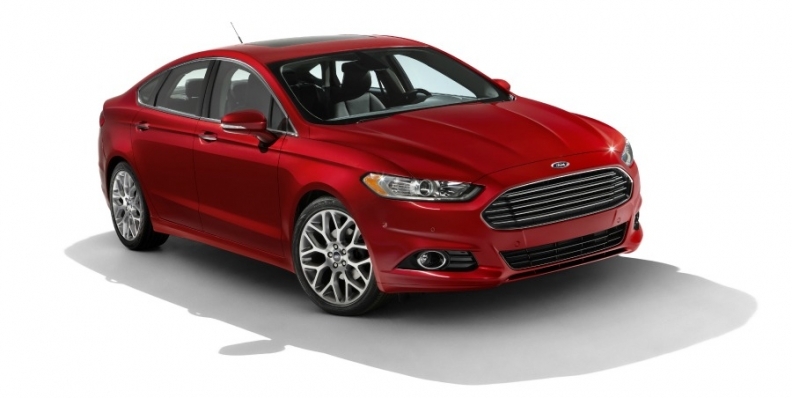 The 2013 Fusion offers a number of technologies typically found only in luxury brands. Those include Ford's electronic Lane Keeping System, active park assist and adaptive cruise control.